MUSKEGON – For Justin Jennings to arrive where he is today was almost impossible. He entered college reading at a third-grade level. He nearly flunked out. Today, with four degrees to his name, Jennings is superintendent of Muskegon Public Schools, a job that leaves him facing another nearly impossible situation. Last year, nearly two out of three Muskegon third-graders were “not proficient” in English Language Arts, the lowest ranking on the state assessment test known as M-STEP. In two years, some third-graders scoring at that level could be held back in their grade, under a state “read-or-flunk” law that goes into effect in 2020. Muskegon and other districts around the state have poured millions of dollars and countless hours into improving literacy in early elementary students in recent years, only to see overall scores go down. In Muskegon, 60 percent of third graders were not proficient in English Language Arts in 2014-15; last year, it was 64 percent. That’s more than twice the “not proficient” rate of Michigan as a whole. But even at the state level, three out of 10 third-graders struggle to read and the numbers are trending in the wrong direction. There is a growing sense of inevitability that tens of thousands of children – many concentrated in Michigan’s urban, low-income school districts – will not meet the third-grade reading standards set for the 2019-2020 school year, despite what appears to be valiant and exhaustive efforts by districts like Muskegon. Books for preschoolers, literacy coaches and early-reading curriculum haven’t moved the needle, and Jennings worries a law intended to help children succeed may have the opposite effect, because of the negative long-term effects of retaining students. “There’s more to these students than a test score,” Jennings said. Bridge Magazine and The Center for Michigan will be in Muskegon Wednesday as part of its Truth Tour, a year-long campaign that’s spreading fact-based reporting on Michigan’s top issues before the Nov. 6 election. The meeting in Muskegon, 6:30-7:30 p.m. Wednesday at the office of United Way of the Lakeshore, 31 E. Clay St., will focus on education. Studies show third grade reading skills are critical. How well children read in third grade often predicts how well they’ll do in the rest of their school career. Students who are good readers by third grade drop out less, and are more likely to go to college. That means better jobs and higher pay over a lifetime. Michigan’s third-grade reading law was a recognition of the importance of early literacy and the state’s determination to address the problem rather than simply wave struggling students through to the next grade. Under the law, third-graders whose readings skills are more than a year behind their grade level are recommended for retention in third grade. There are numerous exemptions to the third-grade reading law, including for English language learners and children in special education, as well as for students who demonstrate adequate reading skills through school work beyond the M-STEP. Still, it’s likely that thousands more children will flunk third grade than do currently and that, because test scores tend to correlate with income, the majority of those held back will be low-income children like those at Moon Elementary in Muskegon Among other things, such a scenario raises questions about how schools and districts might redeploy resources and teachers. Critics of the law also note studies that point to the negative impacts of flunking students, including damaging social connections and increasing the likelihood of students’ dropping out. The issue has even entered this year’s campaign for governor. Republican nominee Bill Schuette announced in March that if elected he would boost early literacy by creating a cabinet-level state literacy director, placing reading coaches in every elementary school, creating summer reading programs and the like. Schuette, who also vows to cut taxes, did not say how much more his reading proposals would cost or where program funding would come from; nor did he specifically address the state’s third-grade “read-or-flunk” policy at the time. Asked where she stands on the third-grade retention law, Democratic nominee Gretchen Whitmer told Bridge in July the state “shouldn’t punish students because our leaders have failed to make public education a priority.” She called for universal preschool, tripling the number of literacy coaches, and giving students “the in-school wraparound support they need – like counselors, social workers, school nurses, school security, healthy meals and safe transportation.” Whitmer, likewise, has not put a price tag on these services, nor has she said if they would require raising taxes. Since the third-grade reading law passed in 2016, Moon Elementary has added “classroom libraries” in its classrooms, filled with books purchased through donations. Moon Principal Okeela McBride ticked off the school’s other early literacy efforts: “We have extended school day at the K-2 level,” McBride said. “We have Champs, MTSS, Kagan training.” The school is part of the Reading Now Network, an early literacy program organized by superintendents in West Michigan, and uses i-Ready curriculum software to track student progress. Across Muskegon County, more than 22,000 books have been distributed to low-income families with pre-kindergarten children since January, said Muskegon Intermediate School Superintendent John Severson. “With those books, we’re messaging to parents about the importance of literacy,” Severson said. Across the state, $80 million has been spent on early literacy efforts since the third-grade reading law was passed. And scores have gone down. Two years ago, the percent of Moon third-graders who tested at a proficient or higher level jumped from 6 percent to 18 percent. But last year, that figure dipped to 11 percent. On average, Muskegon’s third-graders were 1.7 years below grade level according to an analysis by Bridge Magazine and Stanford University that looked at data from 2009 to 2015. That means the average Muskegon third-grader is in grave danger of being tapped for being held back under the new law. Jennings said he scraped through school with coping mechanisms that covered for his poor reading skills. His poor reading caught up with him in his first semester at Purdue University, where the high school basketball star had earned a scholarship to play for the Boilermakers. Jennings said he practiced reading in a quiet corner of the college library. Jennings earned a bachelor’s degree in African-American studies at Purdue, then three master’s degrees at Grand Valley State University. He’s now working on his dissertation for a doctorate at the University of Michigan-Flint. Last Wednesday, after visiting a third-grade classroom, Jennings spoke to a class of high school freshmen, telling them his story of going from struggling to read “The Giving Tree” in college to running a 3,700-student school district. “I say to them, ‘If this is something I can overcome, you can overcome anything,’” Jennings said. 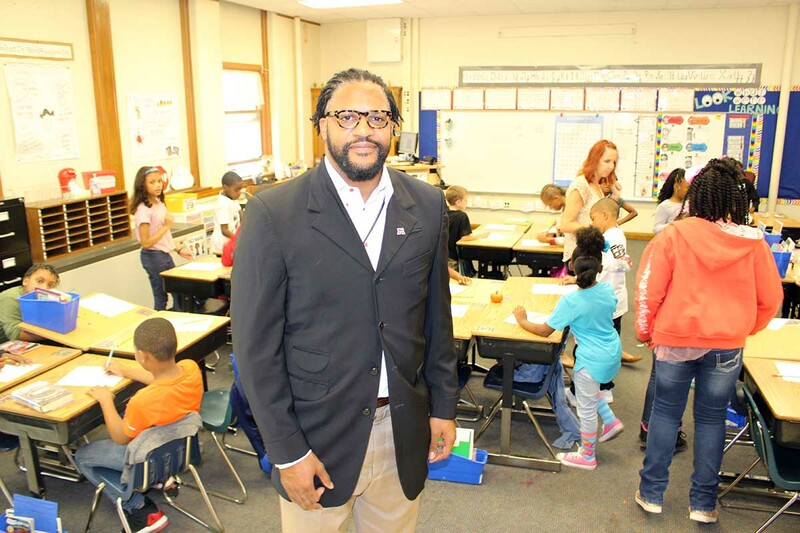 Moon Principal McBride thinks the emphasis on literacy curriculum isn’t enough for students in districts like Muskegon, where 90 percent of students are low-income and 159 students were homeless in the 2016-17 school year. Most of Moon’s students have experienced some kind of trauma, McBride said. “They’ve lost a parent or a father has just gone off to prison,” McBride said. “They go home each day and don’t know where their next meal is coming from or they’re a sixth-grade student forced to raise their little sister because Mom has to work or mom has a drug problem. Jennings and McBride argue that urban schools aren’t going to be able to move the needle on reading without dealing with the trauma that kids are exposed to when they leave the school grounds. The state needs to invest as heavily in social workers and counselors as it does in curriculum, they say. Moon Elementary has a social worker one day a week and no counselors. “Until you know what our kids are going through, it’s hard to even talk about curriculum,” McBride said. I honestly have to wonder what sort of degrees he obtained while reading at a third grade level. Willie - he advanced his reading skills with tutoring and hard work at Purdue, graduated with a bachelor's degree, then got two masters degrees. What is there to wonder about? Still didn’t explain what subject the degrees were in. From the lead in one would suspect basketball. It’s wonderful that he rose above adversity like Abraham Lincoln. The insinuation is that he has gained helpful insites that will benefit mankind. Let’s keep an eye on how he does improving the lives of the children in his charge. Me. Jennings earned his degree in African American studies. I didn’t see how long he has been superintendent of Muskegon schools in the article but I did note that recently the districts scores went down. I applaude Mr. Jennings for earning a degree in African American Studies and subsequent landing of the Superintendents job in Muskegon however I still couldn’t find anywhere in the story where his personal successes resulted in his students successes. Perhaps my reading skills are sub third grade level. So they need volunteers to help with the kids? Would it help to have other adults to read with them and encourage them? What can individual citizens do to help with this, in a volunteering way? I live in Muskegon but am new to the area. I did not know how bad the situation was. As a teacher, you can volunteer at local schools to read with students. There isn't enough people willing to put in an effort to come read with a student on a consistent basis. Reading comprehension is an important part of literacy; check the article again. It says his poor reading skills caught up with him his first semester of college, and he started receiving tutoring. Illiteracy is not a permanent condition. How did it take the first semester of college to catch his reading deficiency. In my day (1960s) he would not have graduated from high school. I have been told today’s college degrees are like yesterday’s high school diplomas, now I believe it. What was a man doing in college that read at the third grade level??? There are people digging ditches who read better than that. I understand compassion but performance is the yardstick of success. College has become an overrated oversold commodity. There are countless college grads doing menial labor to pay off student loans. To make a poster boy out of a guy who was propped up by a politically correct system, then putting him in a position to foster more failure and compassion is the wrong coarse. Eventually people need to take responsibility and advantage of the opportunities offered as they go through life without expecting the system to nurture them continuously. This non political site is starting to look like a far left whining club to me. Burt - I don't understand. You said "people need to take responsibility and advantage of the opportunities offered" yet this is exactly what Superintendent Jennings did while at Purdue - he got a tutor and learned to read fluently and got the first of his degrees. It sounds like the person and the system working exactly as it was set up to do. So so here is the deal. I am the retired ditch digger who could read beyond the third grade level. I couldn’t play basketball but I could carry a rifle and fight in a war that earned me my countrymens loathing until just recently we’ve become heroes and saints. I did go to college on the GI bill but gave it up as a waste of time while trying to support a family. My son, also a vet recently graduated from Michigan State with a Math Degree. He makes his living and pays off his student loan by working in a machine shop. I guess my wonderment is in why a kid who couldn’t perform at a third grade level got into college without being someone’s point to poster boy???? Burt, Mr. Jennings didn't do anything to injure you, but you injure him when you question his competencies. Purdue is in the top 25 public universities; I think we have to trust that a degree from Purdue demonstrates ability and hard work. Mr.Jennings is not responsible for your personal and professional decisions but you imply his reported success has costs you something. You may be entitled to your anger but are you clear about the cause of it? Thanks for letting it all hang out. Actually, your comments could have been the beginning of some significant discourse, although it does not yet appear to have gotten there. But, firstly, let me congratulate you for raising a son who shows some promise of doing better economically than you have managed to do. With ever-increasing global economic competition, that is becoming something that is more and more uncommon. Whatever your opinionated deficits might be, that's an important accomplishment. Far too few of our children these days are motivated to master mathematical skills, even though that is exactly what they need to do to be able to provide the skills needed in emerging robotic manufacturing. And kids do not usually make these choices without a lot of reinforcement and support from their parents and family. Back again to your son, somewhere down the line, I hope he does well enough to make a very good living for himself, and to then consider a career in teaching, because math proficiency may actually be more important in the emerging economies than is reading comprehension. But, be also aware, there are more than 7 billion folks now on this planet who fundamentally have just as much smarts as any of us, and they are openly competing with us for every job that needs to get done. I too was a late bloomer. In my small Kentucky farm community school in the 1940s, I did not learn to read until the end of the fourth grade. My mother had an eighth grade education, but she never read to us; her mother had never read to her. It would not have happened even then, had my 4th grade teacher, Mrs. Leach, not read Tom Sawyer to us each day at the end of school while we waited for the busses to come to take us home. But, even being dyslexic (no one knew that back then), it made me determined to learn how to read, and within a year, I had read every one of the 126 books in the fifth grade library. And I went from being a straight "D" student to becoming a straight "A" student. BUT, BOTH Super Jennings and I are statistical exceptions. You can not count upon our examples to show that there is some magical answer to all that ails education in Michigan (or the USA). We are just extraordinarily lucky. I was elected four times to the Detroit Board of Education between 1989 and 1999 until Governor Engler shoved us aside. I also ran again in 2016. I had no expectations of being elected again, but I did want to put my oar in on my opinion as to what really needs to be done. And I agree, that to begin with, we do not need any more money. For a more thorough exposition of my thoughts, go to: Plunkbenwashburnforschools.com. Burt you seem to have missed something in this article...either you did not read it or your prejudices are showing. You insinuate racist??? No! I am all for equal opportunity but becoming sick of unequal opportunity. How many white boys would have been allowed into Purdue who read at the third grade level?? I am waiting to see how this guy does and I sincerely hope he does well. I am just afraid this whole story is a spin on the old line that more money will fix a moral problem. I blame this on bad parenting. If you don’t direct your children to reading at a young age then you have to share the blame. Knock off the video games and direct them to a book. Mr. French is applying the same tired approach other media outlets have done to death regarding education here in America, but here is a question that strongly bears repeating (again): Where are the parents? Where are THE PARENTS when you have someone who is going through middle and high school with such an obviously poor education? Making matters even worse, besides reading what others areas was Supt. Jennings deficient at during that time? Where were THE PARENTS when that same students GRADUATES high school? If your child cannot even read their own diploma, THE PARENTS have not done their job overseeing their education..
Where were THE PARENTS when their child gets accepted into an institution like Purdue? What did THE PARENTS expect? That their child won't be expected to do any classroom work because they can throw a ball? To be fair: I'd say shame on Purdue for even accepting a student with such a poor academic record in the first place just because they were more interested in winning a few basketball games. They should've know better! As alluded to near several times in this piece, the same tired solution is to throw even more money at the problem. That's been done before (repeatedly) and as I mentioned on another post regarding the gross disparity in funding in districts like DPSCD and those in northern Macomb County compared to their test scores (the southern end of Macomb has seen their test scored crater due to the movement of former DPSCD students into them dragging down the entire district), you might as well pour gas over a huge pile of money and throw a match on it because it will have the same result. Politicians like Whitmer absolutely love to tell people they will spend more government money because, sadly, it helps buy their votes in the next election. Politicians don't like to tell people where that same government gets that money (Michiganians), because if she did, she might concede the election to Schuette and drop out of the race today. Bottom line: No parental interest in their child's education, no improvement in test scores. Sadly the problem starts long before a child enters school. A significant portion of a child's brain development occurs before age 3 (https://www.imls.gov/assets/1/AssetManager/GrowingYoungMinds.pdf). Families that do not expose their young children to reading early on then have children who do not have the exposure to language and other early literacy skills they need to be ready to read when they start Kindergarten. I suspect many parents themselves do not have strong literacy skills or are relying on giving their children electronic devices, a poor substitute. Distributing books to kids is always a good thing, but children need to be engaged and inspired to read or be read to. As a public library director I am often baffled by all of the discussion about the poor reading achievement scores we are seeing across the state, yet when are professional librarians and our public libraries included in the discussion or mentioned as part of the solution? Our services and programs are available in just about every community in Michigan and are almost always free of charge. Further, professional media specialists (a.k.a. school librarians) have been practically eliminated in the name of addressing "other priorities." Bottom line, I think that third grade is way too late to address this crisis. A teacher's perspective: The thing that I don't get is that so few people talk about how ridiculous the M-STEP is, which is what all of this data is based off of. Kids need equal parts reading skills and computer skills to do well on the assessment. Not to mention that the test questions and passages are really, really hard! I'd be curious to see what statewide data looked like if it was based off the reading assessments that teachers do one on one with students, not to say that is a good solution, just that I'd like to see another format for gathering data on our kids reading abilities. I don’t understand how this article struck a nerve with me but obviously it did. Maggie I fully support your one on one idea. We need to explore different channels. Throwing more money at it has proven ineffective. Mr. Jennings’ achievement is a success story that has repeated itself many times over. He bluffed his way through High School as students often do. Purdue University was looking for basketball talent and Mr. Jennings took advantage of the opportunity and worked hard to better himself. A caring adult entered the picture which is a major contributing factor. Blaming the students for their parents doesn’t solve anything. There is not much a school can do to provide a different set if parents. and students need multiple approaches. What is missing is access to lots of books and reading time IN SCHOOL. Trying to shortcut the practice element will not work. I think a student needs an interest in reading outside of the school environment, if they regard reading as just another school assignment but don't do anything beyond that they are probably not going to develop a real desire for reading. Reading opens up a world of understanding about many things. What a croc. Mr. Jennings and his $185K salary laid off those social workers while giving himself and other admins $500K in raises. This man has been in the chair only 1 1/2 years and is already on a plan of assistance. The school district is actually paying someone to hold his hand and help him make decisions through this process. In addition, the old superintendent Felske is getting $20K a year for 5 years to do the same thing, yet Jennings continues to fail. He needs to go. This is sad and the commentary is sad. Teach teachers how to use explicit phonics and drop whole language, then watch kids learn to read. It is not rocket science.